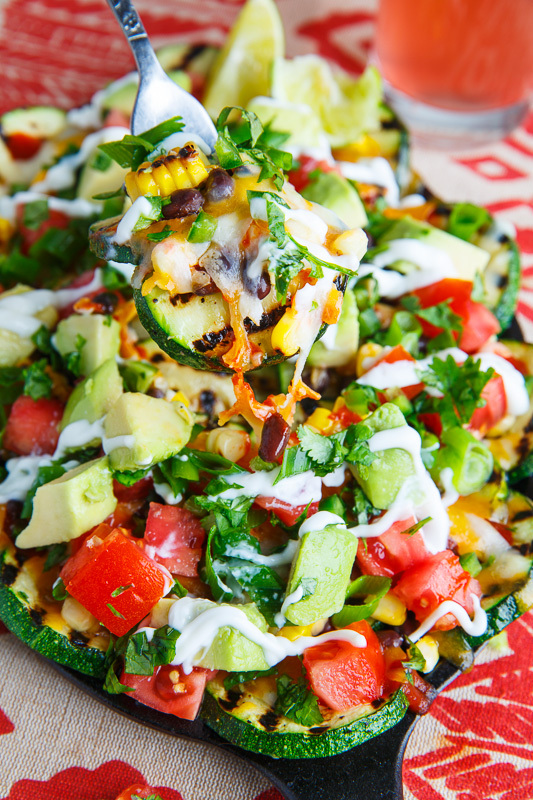 Fresh grilled zucchini served nacho style topped with corn, tomatoes, beans, avocado and plenty of melted cheese! Zucchini season is definitely here! 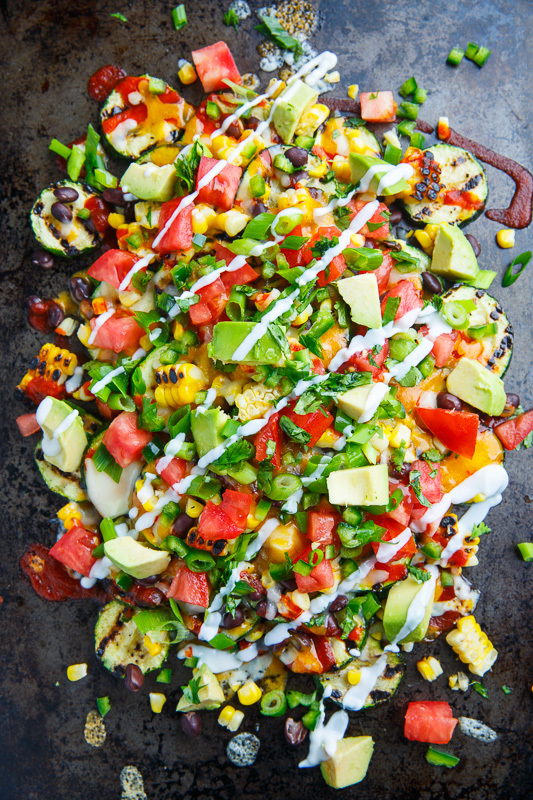 The stores are full of it and it ‘s pretty cheap so I picked up a lot of it with the plan to start off by making these grilled zucchini nachos! The idea is to slice the zucchini into 1/4 inch discs, grill them until just tender, but still crisp, and then to top them with a bunch of nacho toppings including plenty of melted cheese! As far as the toppings go I start out with some grilled corn off the cob, black beans, tomatoes, jalapenos, onions, avocado, cilantro and a finish of sour cream. 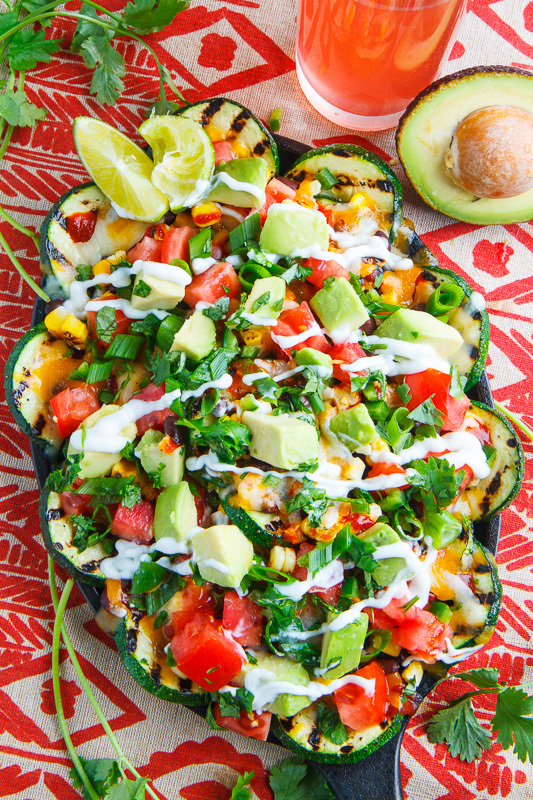 With all of the fresh summer ingredients, these grilled zucchini nachos are pretty healthy in addition to being nice and tasty! One of the great things about these zucchini nachos is that you can top them with whatever you want so feel free to use your favourite nacho toppings! This years zucchini season is off to an amazing start with these grilled zucchini nachos which will quickly become a staple in my summer meal plans! Toss the zucchini in the oil, salt and pepper and cook on the grill or in a grill pan over medium heat until just tender but still slightly crispy, about 2-3 minutes per side, before topping with cheese and cooking until it melts, about 1-2 minutes. 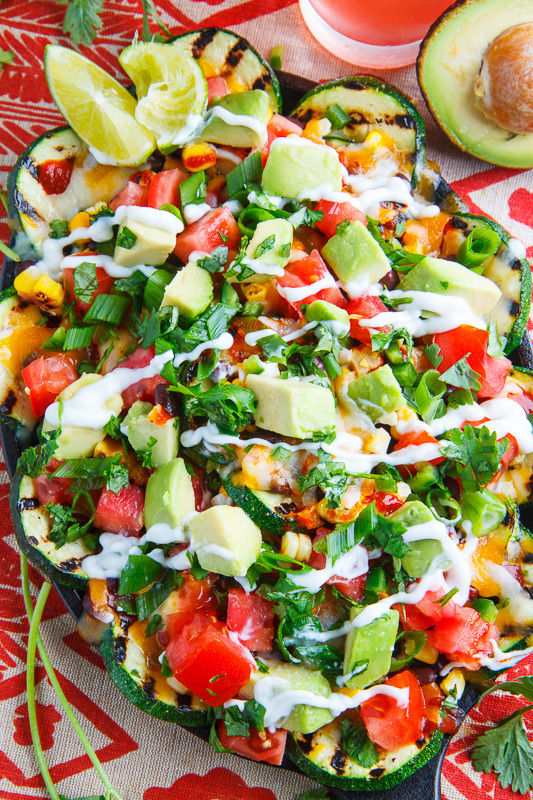 Serve the cheesy grilled zucchini topped with the beans, corn, tomato, onions, jalapeno, avocado, cilantro, sour cream and lime juice. Option: Use your favourite nacho toppings. Kevin, this is seriously the BEST idea ever! I've used raw zucchini chips with dip but love this! trying this! WOW! I would totally love a platter of these!! I love grilled zucchini. Yum, it looks good! 25 minutes for nachos for four? With some help I might stick within the time. It would be difficult if I would be alone. I think this is about to become my food best friend!!! HOLY SMOKES! I'm with Julie! I could eat the whole thing! All those toppings! Love the idea of veggies instead of corn chips! 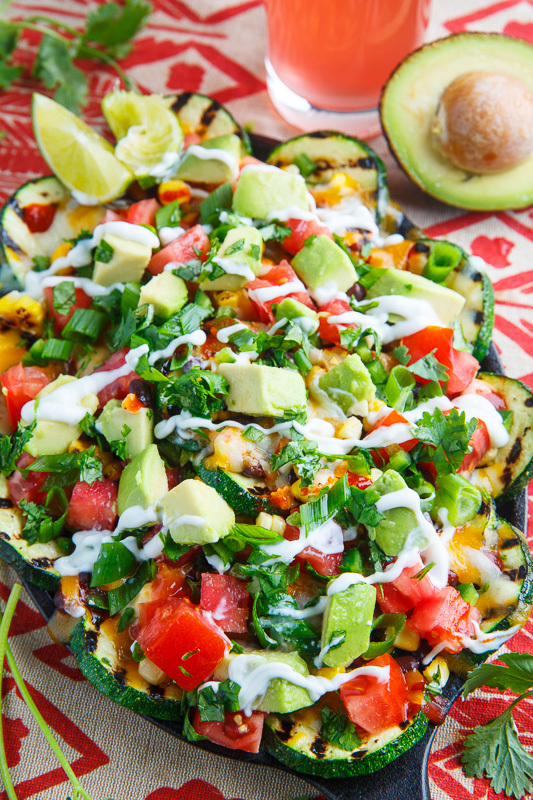 I need to fire up the grill and try these zucchini nachos!! Love grilling my veggies in the summer! These nachos are LOADED with so much deliciousness! We have a HUGE zucchini in the fridge so I might have to make this for dinner. Love this idea!I can eat a whole plate! Love this recipe! Thanks for sharing and also for your great and colorful pictures. The GIF was cool too! You have the best recipes. It's appreciated! This is scary! This morning I was trying to find something different to make with zucchini and, tada, here you are! Can't wait to try this. Thanks, Kevin.